Figure 1.--Note the long sausage curls on this older boy which his mother has lovingly laid on his lace collar so they would be clearly visible. The picture was taken in the early 1890s. Doting Victorian and Edwardian mothers kept their treasured sons in dresses and long curls. As the 19th century passed boys were less frequently kept in dresses and their hair was cut earlier. Some mothers, however, kept to the traditional practices well into the 20th century. Even after graduating to kilts or boyish suits such as sailor suits and other outfits such as little Lord Fauntleroy suits, a boy might be kept in long-flowing curls. Some mothers might wait until a boy was 10 or even 11 before allowing him to have his long curls cutting. Romantically inclined mothers, influenced by English-American authoress Francis Hobson Bennett, kept their sons in curls, a fashinoable statement when wearing Little Lord Fauntleroy suits or other fancy clothes such as kilts. 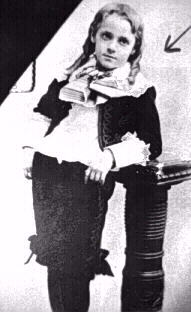 Many mothers had delayed cutting their sons hair before the publication of Mrs. Bennett's instantly popular, a least among mothers, Little Lord Fauntleroy in 1886. After publication, however, it not only became more popular to delay cutting a boy's hair, it became fashionabe to curl it. Boys' in long fashionable curls, sometimes boys as old as 10 or 11 could be seen. Many reports exist of boys kept in curls well into their boyhood. 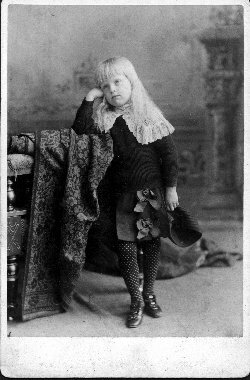 Franklin Roosevelt in the 1880s who was raised at home wore dresses, kilts, and Fautleroy suits crowed with carefully maintained curls. 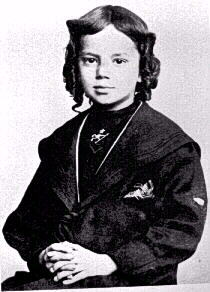 Figure 2.--Note this boy's (H. Christie) long tresses which have not been curled. His mother has kept him in a dress with elaborate work on the skirt and a very wide,lacey Fauntleroy collar. The picture was taken in the late 1880s. elaborate outfits like Little Lord Fauntleroy suits or kilts. It was always a major rite of passage for a boy to finally have his curls cut and allowed to wear more closely cropped hair. While long hair for boys in the 1960s became very fashionable, it was certainly never curled. In previous years, however, long hair, even uncurrled long hair, was generally perceived as girlish. As a result many a boy looked forward with great relish to have his locks trimmed. For many a doting mother, however, it was often a trying experience bringing forth gushing tears and the site of herdarling sons flowing curls falling to the floor. Many mothers would save the clipped curls as keepsakes. Franklin Roosevelt's mother, for example, kept her son's curls in a trunk with his baby dresses and other keepsakes as long as she lived. Figure 3.--Although unusual for the 1920s, noted author Thomas Wolfe's mother insisted on long sausage curls. Mercifully an Uncle took him at 9 years of age to the barber for a hair cut. many boys well into the 1900s were kept in curls. Dressed for boys passed from fashion by the 1920s. Little boys instead wore rompers, smocks, or short pants. A.A. Milne the author of the Winnie the Poo books) says in his autobiography says that he was 10 years old (in 1910) before he was permitted to have his long sausage curls cut. The American author, Thomas Wolfe, describe his long sausage curls which he had to wear until he was 9 years old. The Wolfe family was not even an affluent one and Thomas even sold papers as a boy. His curls did not endear him to his fellow paper boys. As it became increasingly rare for boys to be educated at home, mothers found it more and more difficult to dress boys in fanciful styles. Long hair for boys became fashionable again in the late 1960s. The hair style Jacki chose for John John helped to popularize bangs, although she was critcised in many quarters for her son's hair cut and she eventually had it trimmed. Eventually of course the Beatles helped to popularize longer hair among boys themselves.